Image: Fisherman's Point at Smoke Lake in Algonquin Park on April 16, 2019 (click to enlarge). 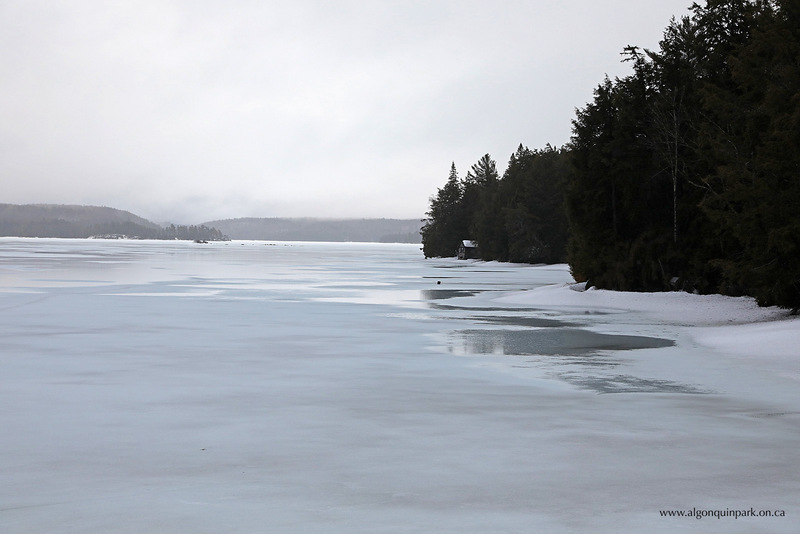 All lakes in Algonquin Park remain ice covered. Rainfall Warning Issued for Algonquin Park — Environment Canada has issued a Rainfall Warning for Algonquin Park with 50 to 80mm of rain possible by Saturday. With significant snow persisting on frozen ground, Ontario Parks has issued a Flood Outlook Safety Bulletin for Algonquin Park informing visitors to avoid moving water, shorelines, and ice covered waterbodies. 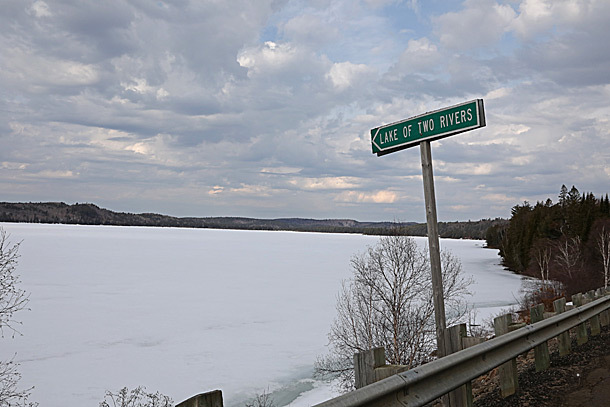 Visitors hoping to paddle the open waters of Algonquin Park's lakes for the opening of trout fishing season on April 27, 2019 may be disappointed this year. 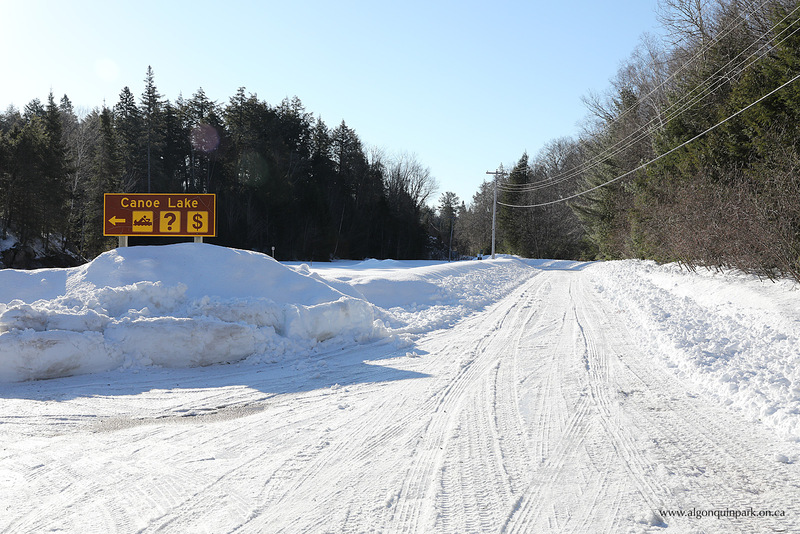 Winter-like conditions persist in Algonquin Park, but strong spring sunshine and warmer temperatures are helping to reduce the snow depth in Algonquin Park. 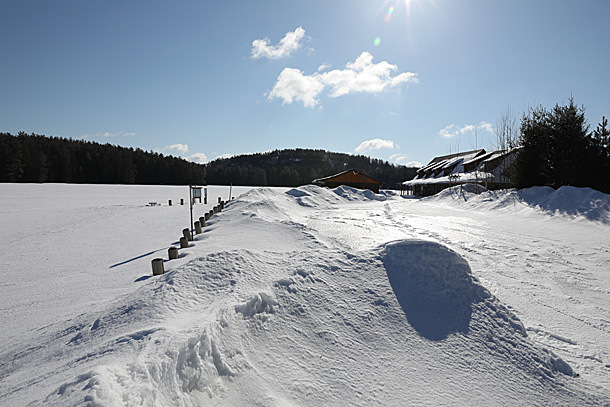 Snow depth ranges from almost bare ground on south facing slopes exposed to strong spring sunshine to more than 60 centimetres of snow on the ground on some colder north-facing slopes. 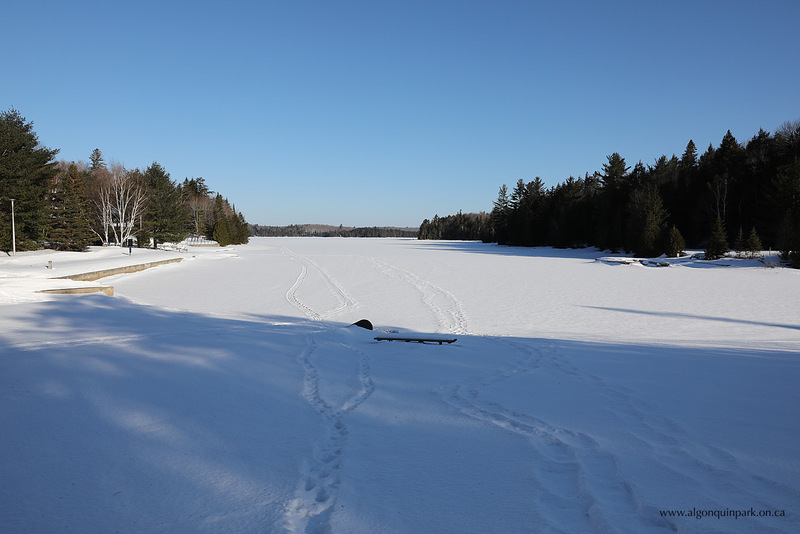 All lakes in Algonquin Park remain ice covered with bare ice just becoming recently visible as snow melts from the ice surface. 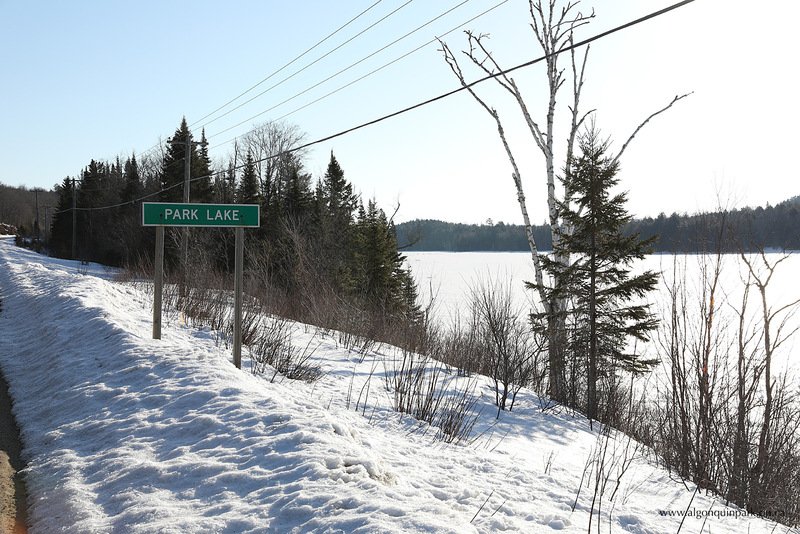 Reports from early April indicate 60 to 80 centimetres of ice on Algonquin Park's lakes. Beaver ponds are still ice covered but some are showing open water at inflow and outflow areas, providing the first refuge for migrating waterfowl. 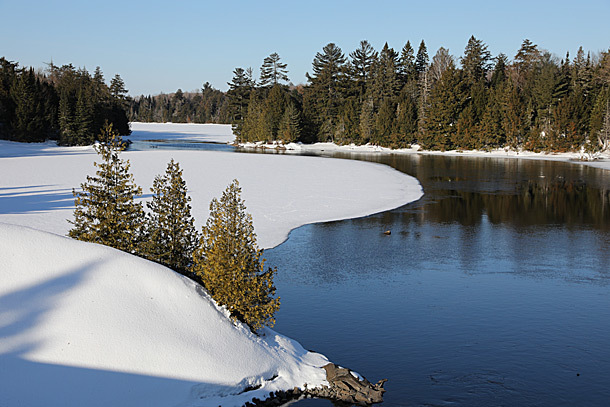 Fast moving rivers and creeks are generally ice free, with higher water volumes from recent melting snow and rain. 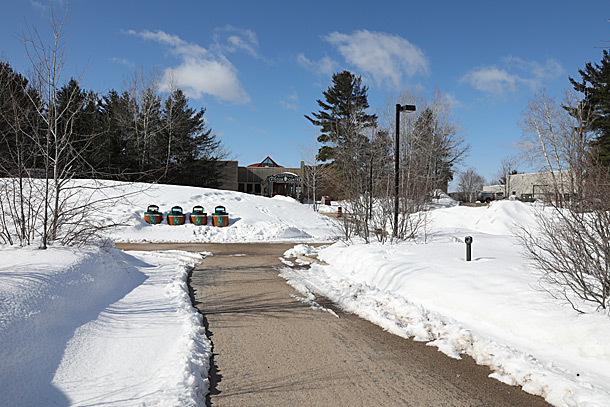 Visitors should avoid high water levels during the spring as cold water can be deadly. 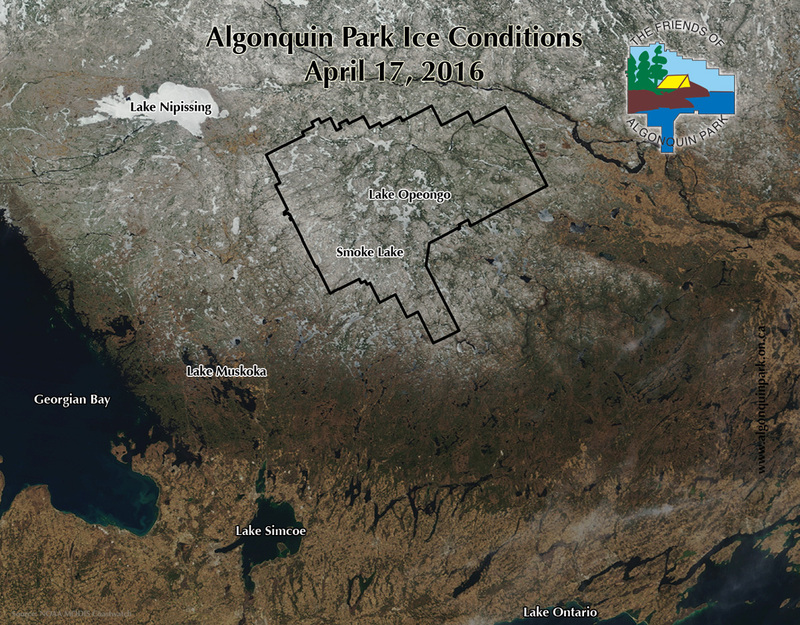 Current conditions in Algonquin Park are not unusual for this time in April. 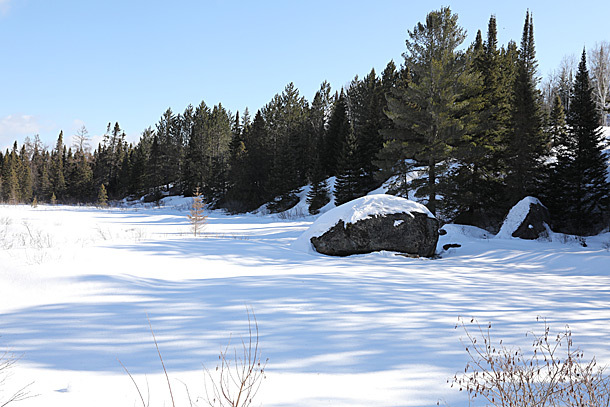 The high elevation area of the Canadian Shield known as the Algonquin Dome on which Algonquin Park is located results a later ice out than surrounding areas, typically occurring in late April or early May. 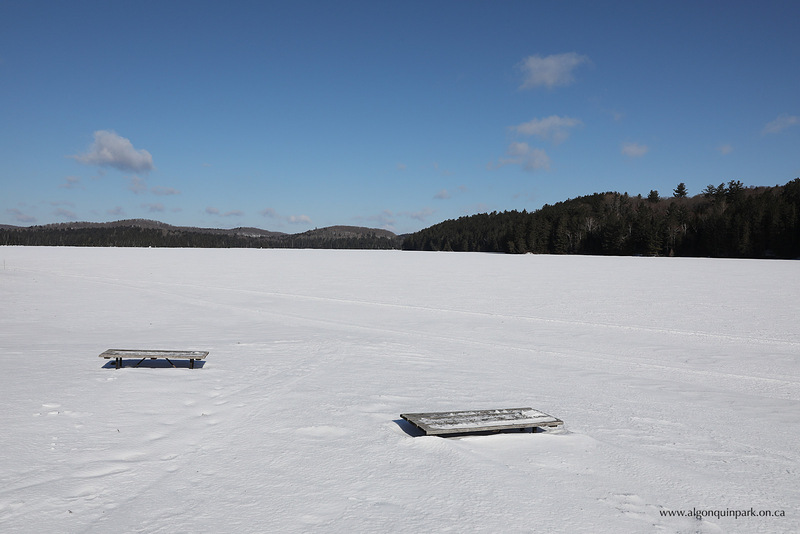 Over the past 50+ years, the average ice out date for Lake Opeongo, Algonquin's largest lake, is April 28. 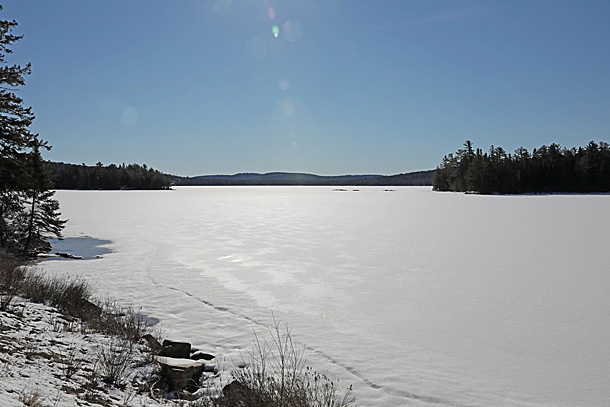 Given variations in winter and spring conditions, the ice out dates for Lake Opeongo have ranged from March 29 (2012) to as late as May 15 (1972). During 2018, ice out was recorded on May 10. 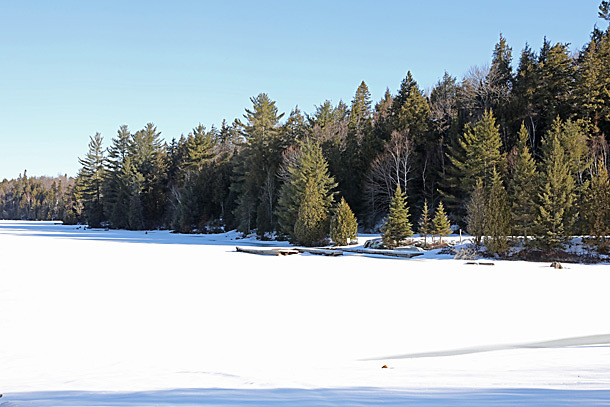 Early spring anglers and canoe trippers should know that on November 29, 2018, Ontario Parks announced changes to spring reservations in Algonquin Park. 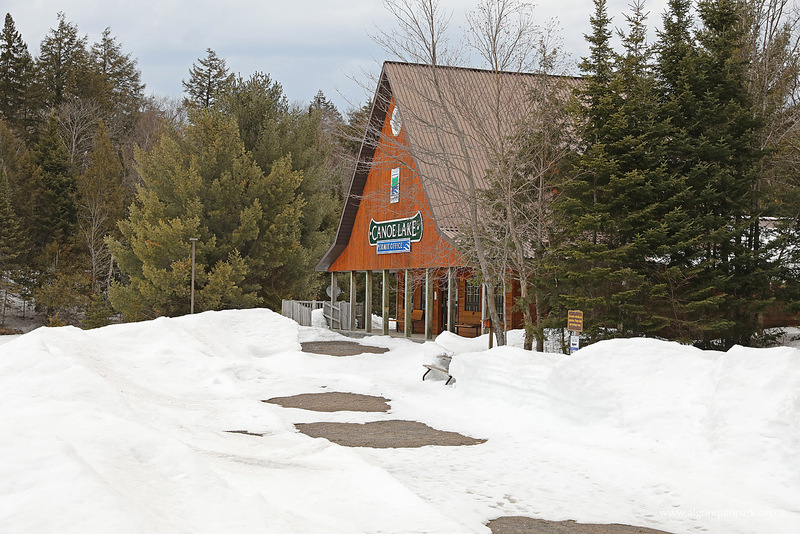 Only first-come, first-served camping opportunities are available until May 3, 2019 (see below for details). 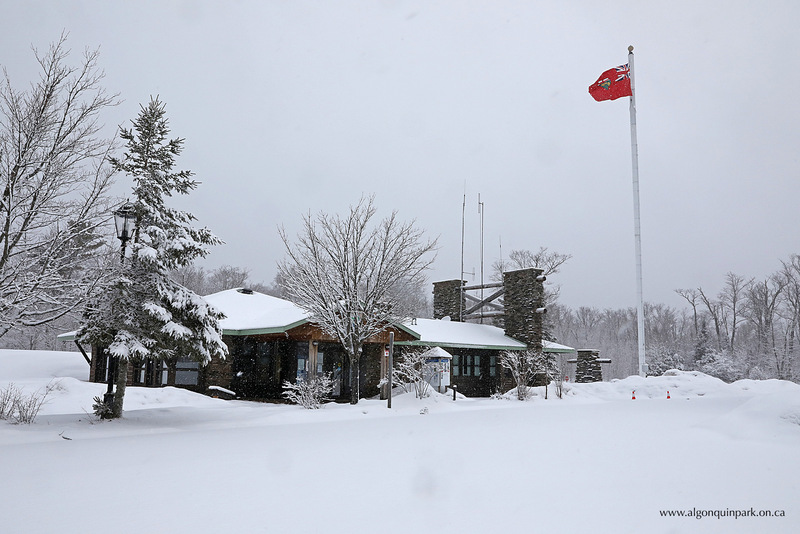 Stay tuned to this webpage for updated Algonquin Park conditions and images. 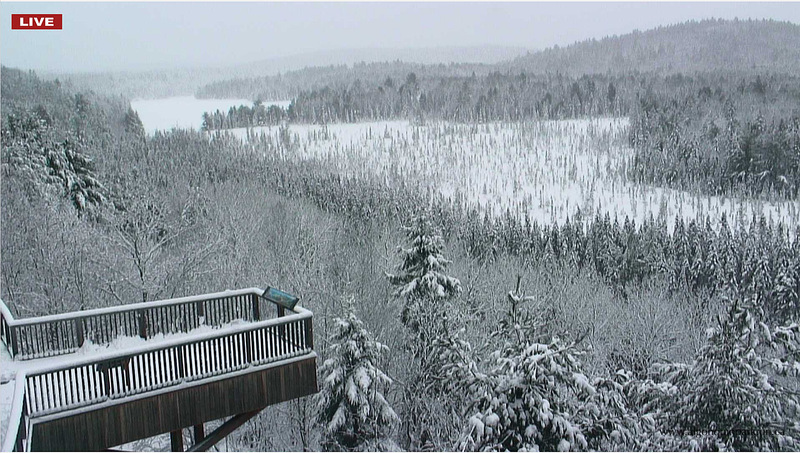 For live views of Algonquin Park including the ice of Fork Lake visible from the Visitor Centre see the Algonquin Park Webcam. 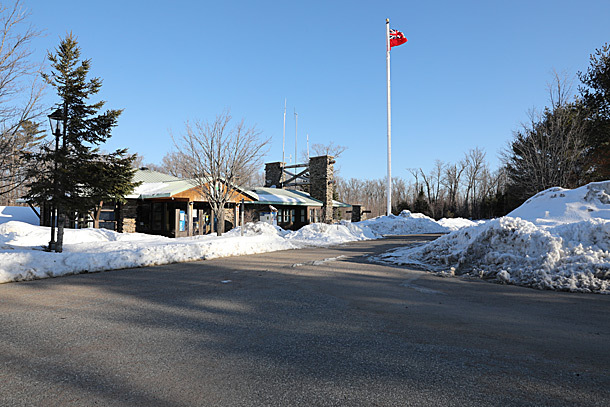 Snow depth and weather conditions are recorded hourly at the East Gate available on the Algonquin Park Weather webpage. For the latest closures and restrictions see Algonquin Park Advisories. 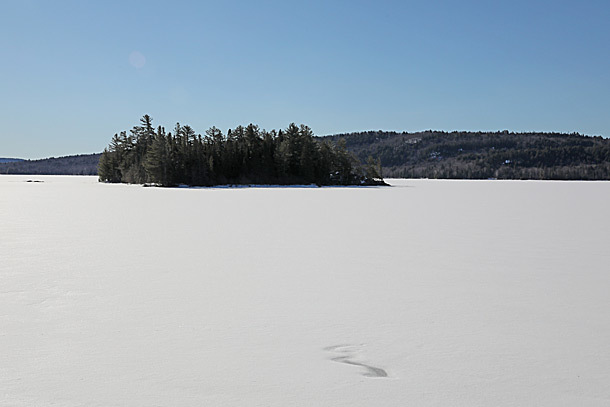 Please remember that The Friends of Algonquin Park advises against ice travel due to a range of environmental variables and the difficulty in detecting hazards. 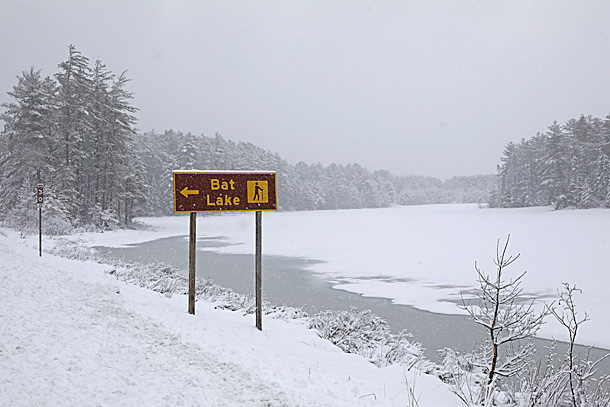 Be safe, stay off the ice. Park visitors are encouraged to stay away from fast moving and icy cold water at this time of year. "Over the past 5 years, inaccessible roads and unsafe ice conditions in many locations have delayed the spring backcountry reservations and the opening of some campground locations within Algonquin [Park]. This traditional weekend date has coincided with the spring opening date of the trout fishing season in Algonquin [Park], which has motivated many users to access the backcountry. 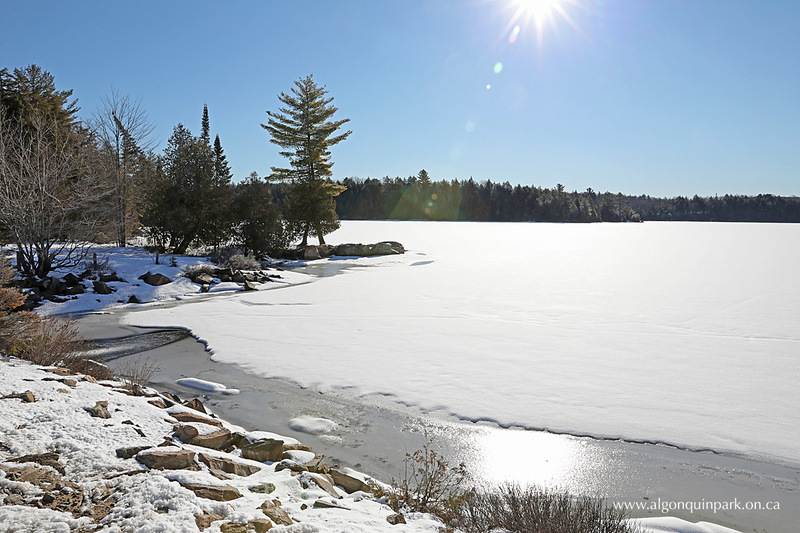 In response to persistent late winter conditions, Ontario Parks has modified the reservation window for backcountry camping and hiking as well as some campgrounds for spring 2019. 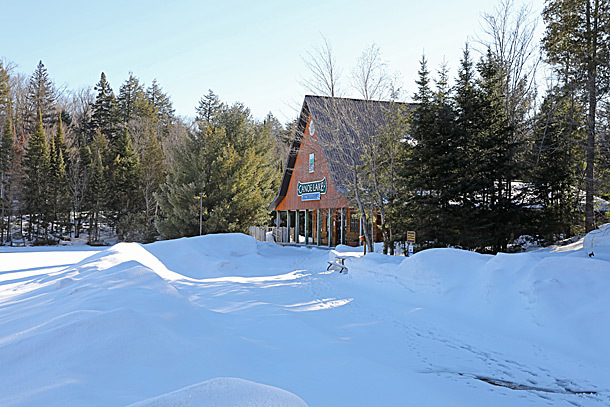 If conditions permit, we will allow access to the backcountry and select campgrounds for April 26, 2019, on a first come, first-served basis. In some locations, the backcountry may be accessed as a day-use area once trout season opens. Mew Lake Campground (please note that sites 1-33 and the yurts remain reservable year-round in Mew Lake campground). If you have comments, questions or concerns, you may send them directly to Ontario Parks." Image: Canoe Lake Access Point Office in Algonquin Park on April 16, 2019 (click to enlarge). 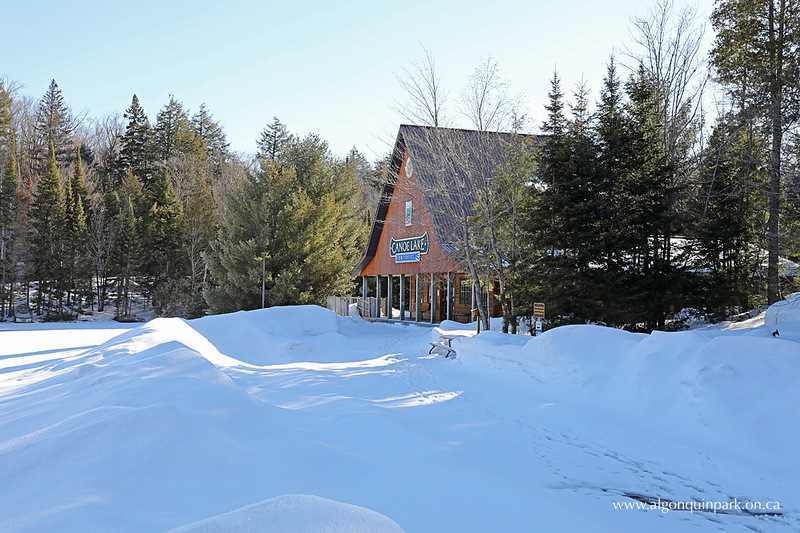 A selection of recent images from Algonquin Park. See the caption for the date and location. More images are available on The Friends of Algonquin Park Facebook Page. Image: Smoke Lake in Algonquin Park on April 16, 2019 (click to enlarge). 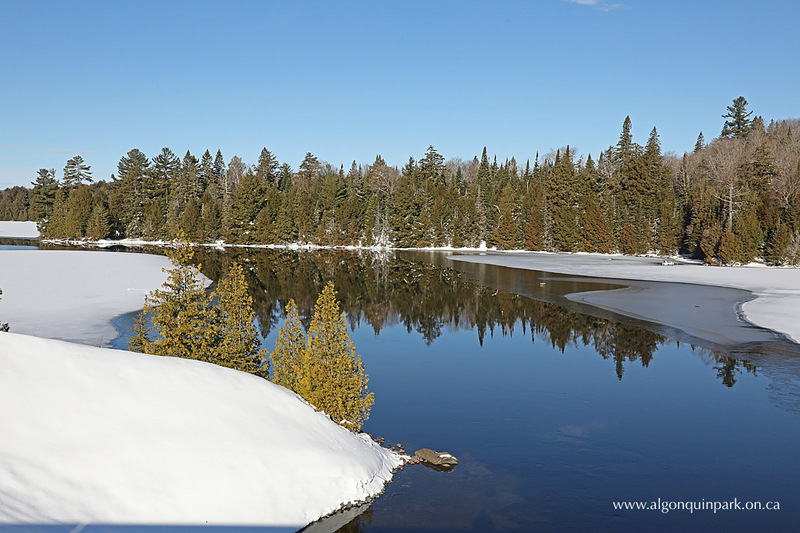 Image: Mew Lake in Algonquin Park on April 16, 2019 (click to enlarge). 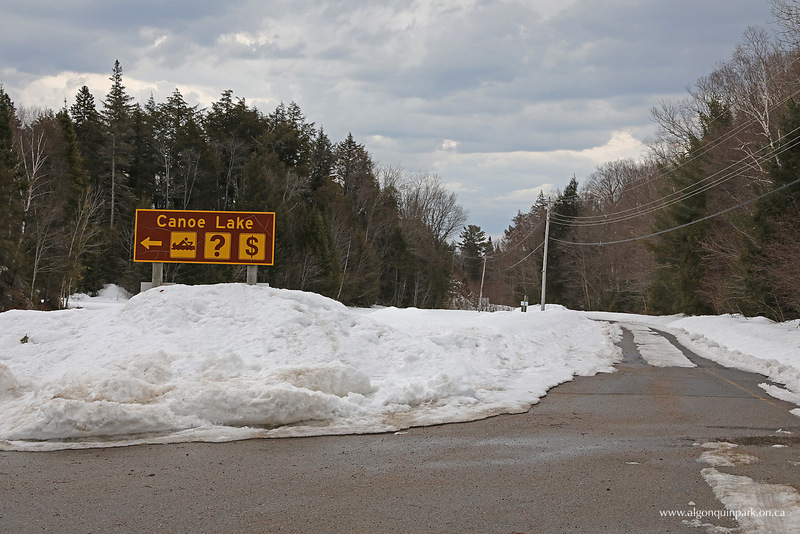 Image: Canoe Lake Access Point parking lots in Algonquin Park on April 16, 2019 (click to enlarge). Image: Lake of Two Rivers in Algonquin Park on April 16, 2019 (click to enlarge). Image: Smoke Creek in Algonquin Park on April 16, 2019 (click to enlarge). 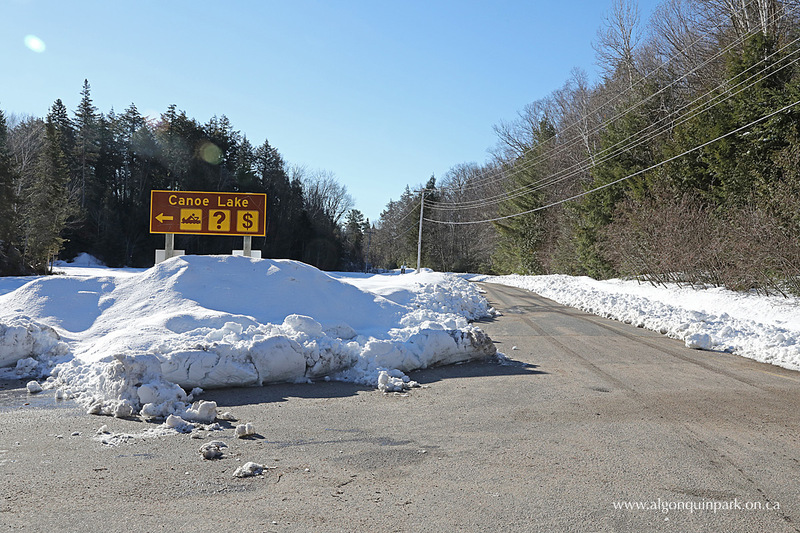 Image: Near Tea Lake Campground in Algonquin Park on April 16, 2019 (click to enlarge). Image: Canoe Lake in Algonquin Park on April 16, 2019 (click to enlarge). 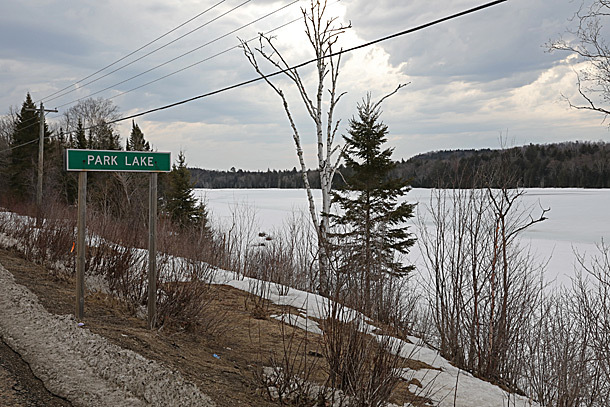 Image: Mew Lake in Algonquin Park on April 15, 2019 (click to enlarge). Image: Algonquin Park Visitor Centre on April 15, 2019 (click to enlarge). Image: Park Lake in Algonquin Park on April 15, 2019 (click to enlarge). 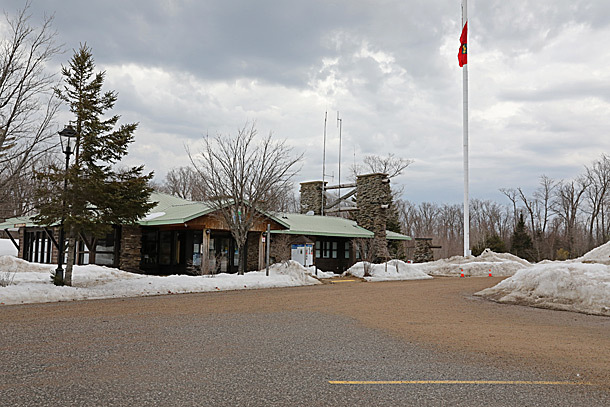 Image: West Gate in Algonquin Park on April 15, 2019 (click to enlarge). Image: Algonquin Park Visitor Centre Viewing Deck as seen from the Algonquin Park Webcam on April 15, 2019 (click to enlarge). 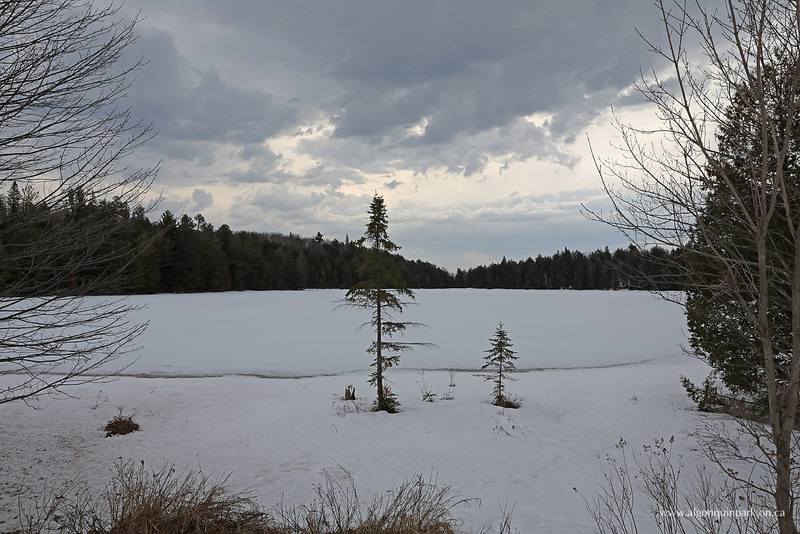 Image: Mew Lake in Algonquin Park on April 15, 2019 (click to enlarge). 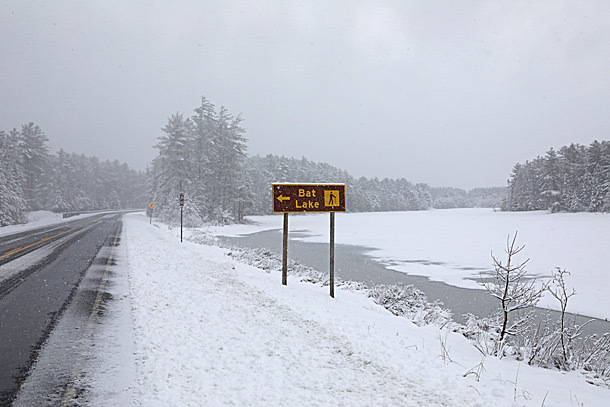 All lakes in Algonquin Park remain ice covered, including Mew Lake showing some slushy ice covered sections along Highway 60. 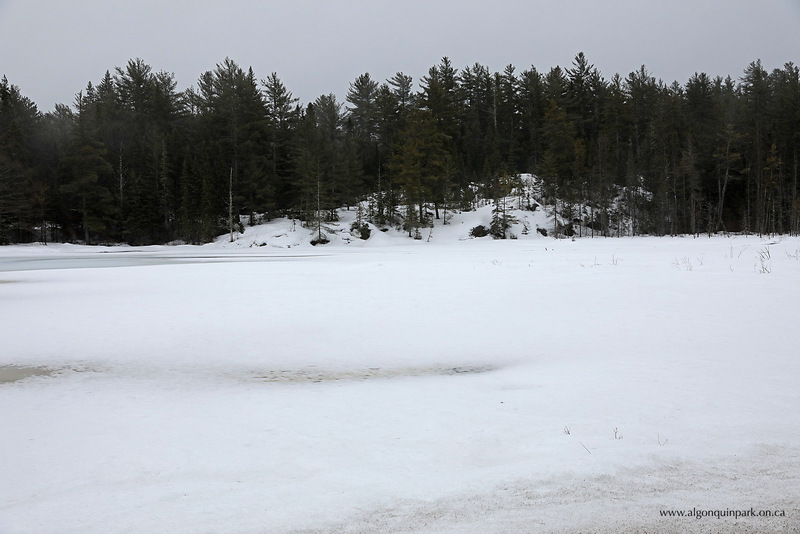 Image: Found Lake in Algonquin Park on April 12, 2019 (click to enlarge). 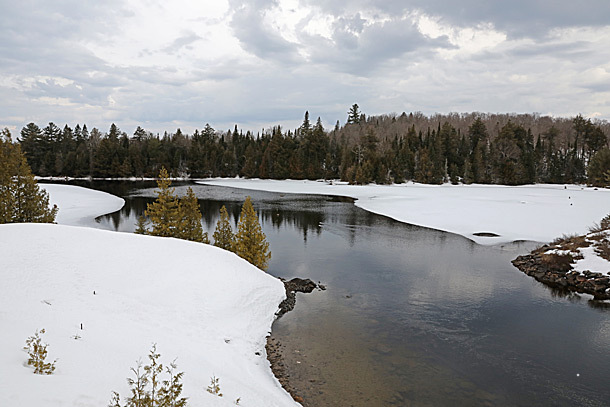 Image: Smoke Creek in Algonquin Park on April 12, 2019 (click to enlarge). Image: Smoke Lake in Algonquin Park on April 12, 2019 (click to enlarge). Image: Mew Lake in Algonquin Park on April 12, 2019 (click to enlarge). 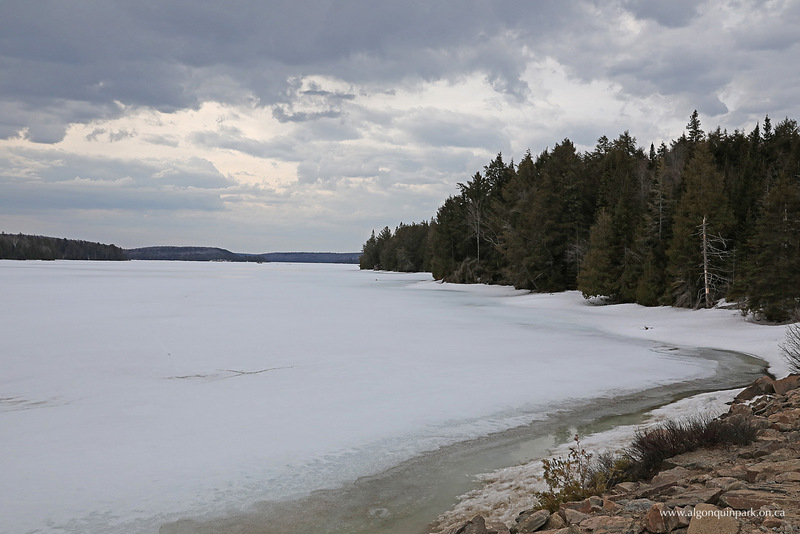 Image: Lake of Two Rivers in Algonquin Park on April 12, 2019 (click to enlarge). 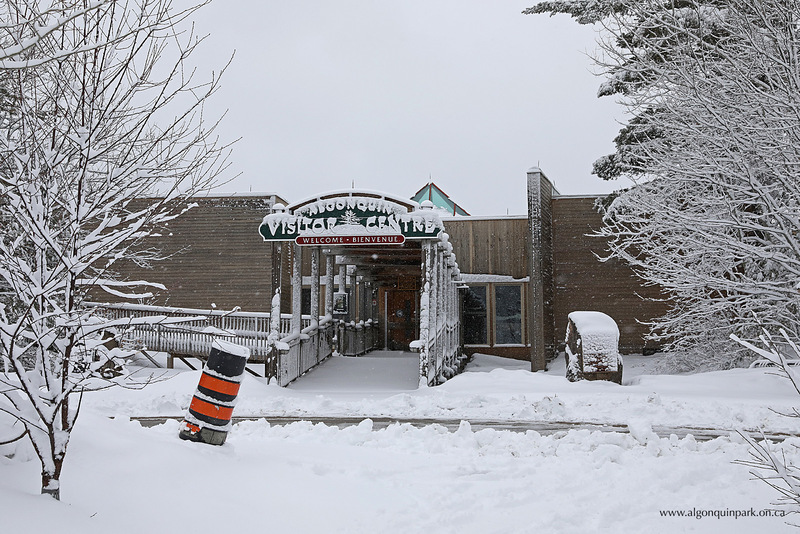 Image: Visitor Centre in Algonquin Park on April 12, 2019 (click to enlarge). 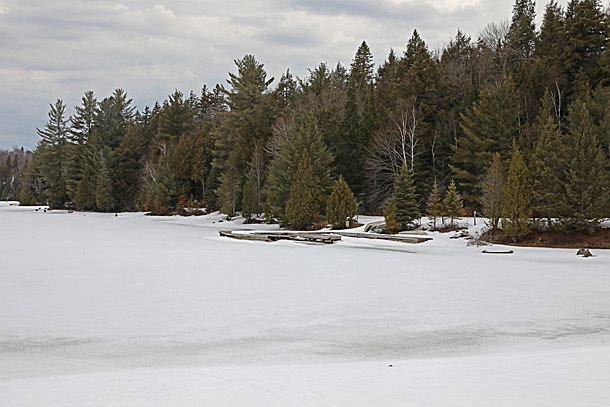 Image: Canoe Lake in Algonquin Park on April 12, 2019 (click to enlarge). 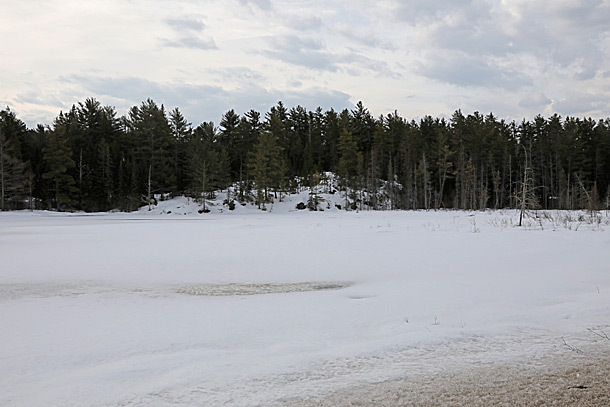 Image: Park Lake in Algonquin Park on April 12, 2019 (click to enlarge). Image: West Gate in Algonquin Park on April 12, 2019 (click to enlarge). 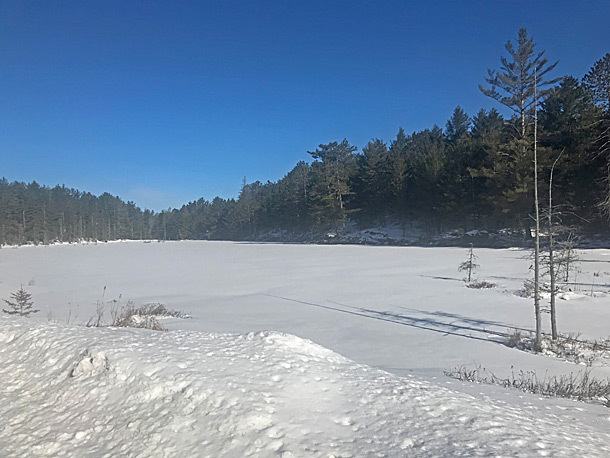 Image: Smoke Lake in Algonquin Park on April 9, 2019 (click to enlarge). 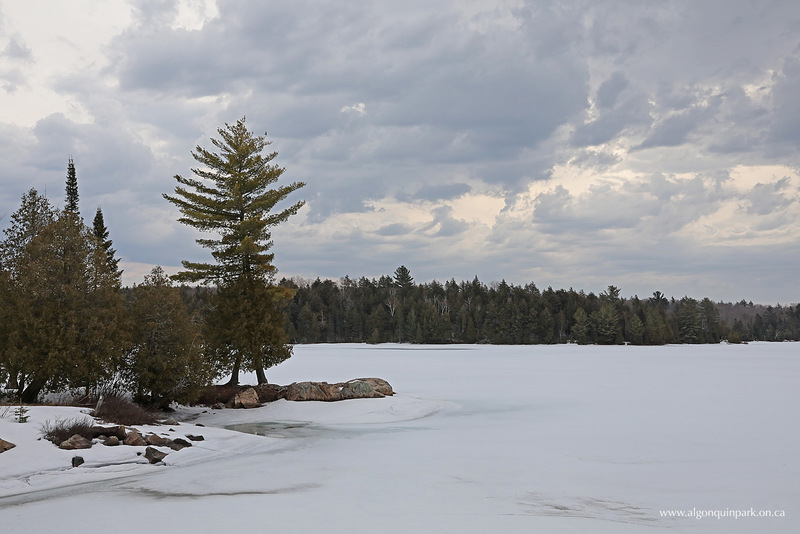 Image: Fisherman's Point at Smoke Lake in Algonquin Park on April 9, 2019 (click to enlarge). Image: Mew Lake in Algonquin Park on April 9, 2019. 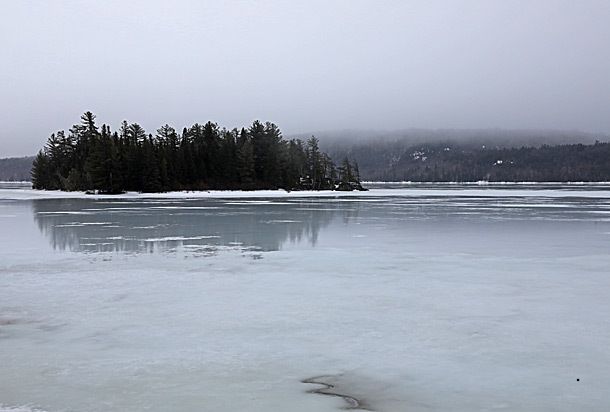 Water shown in the image is on top of the ice and is not open water. (click to enlarge). 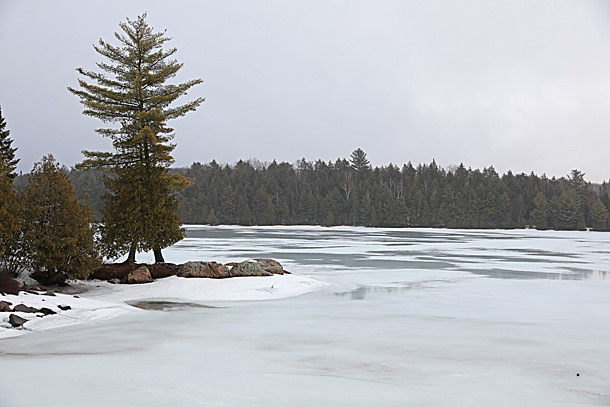 Image: Mew Lake in Algonquin Park on April 9, 2019 (click to enlarge). 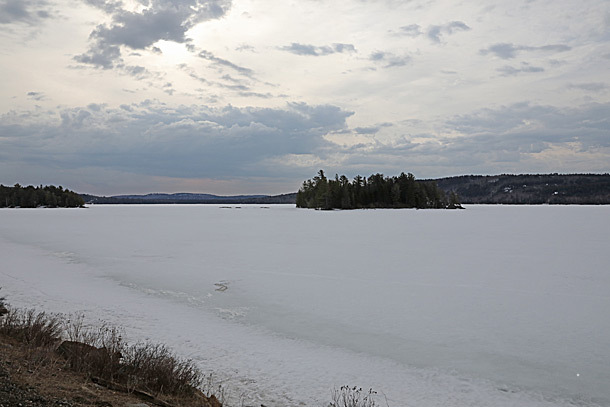 Image: Lake of Two Rivers in Algonquin Park on April 9, 2019 (click to enlarge). 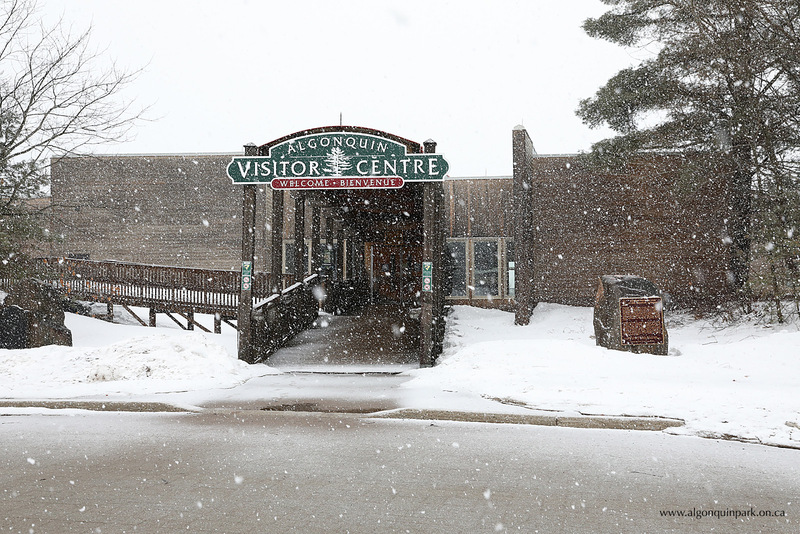 Image: Algonquin Park Visitor Centre on April 9, 2019 (click to enlarge). 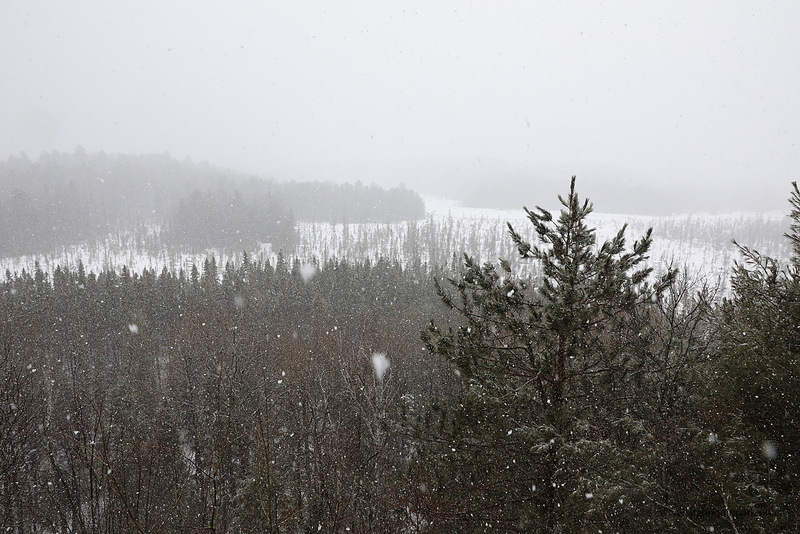 Image: Sunday Creek as seen from the Algonquin Park Visitor Centre viewing deck on April 9, 2019 (click to enlarge). 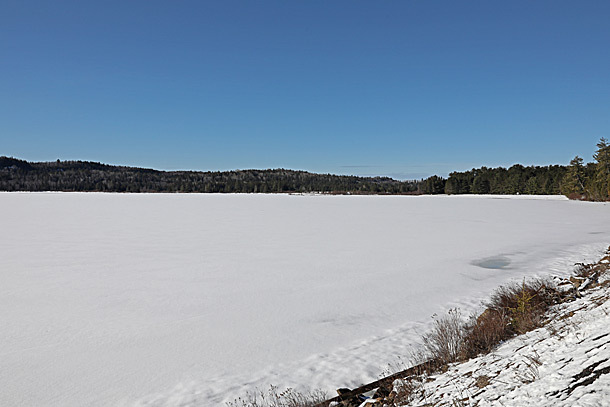 Image: Lake Opeongo in Algonquin Park on April 4, 2019 (click to enlarge). 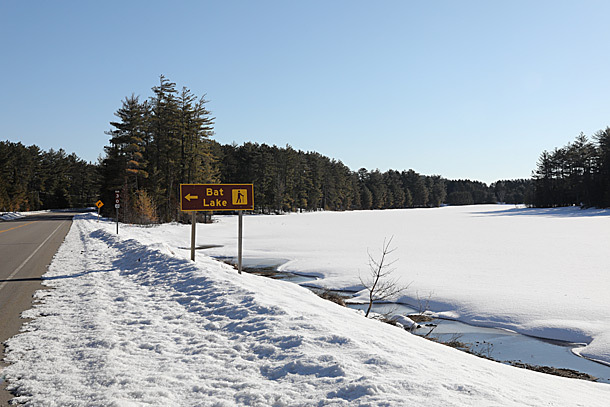 Image: Lake Opeongo Access Point in Algonquin Park on April 4, 2019 (click to enlarge). 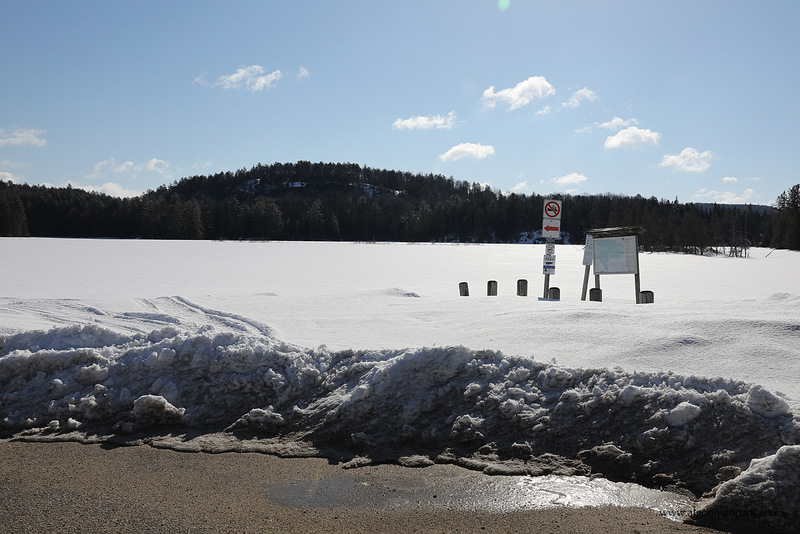 Image: Lake Opeongo Access Point boat ramp in Algonquin Park on April 4, 2019 (click to enlarge). 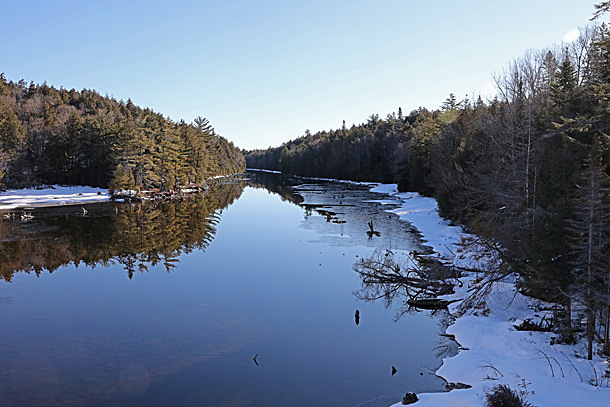 Image: Costello Creek in Algonquin Park on April 4, 2019 (click to enlarge). 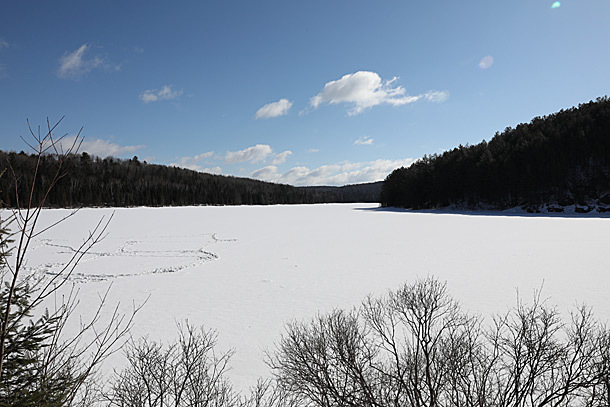 Image: Costello Lake in Algonquin Park on April 4, 2019 (click to enlarge). 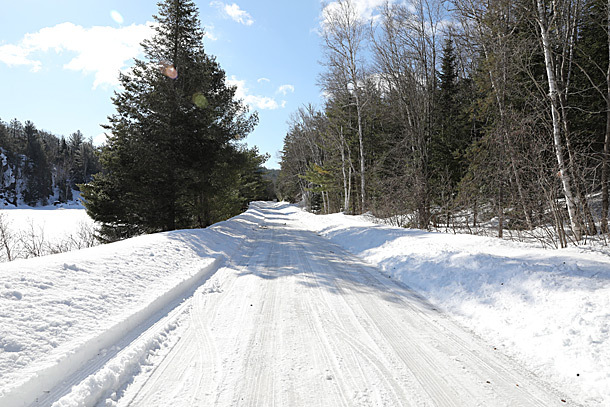 Image: Opeongo Road in Algonquin Park on April 4, 2019 (click to enlarge). 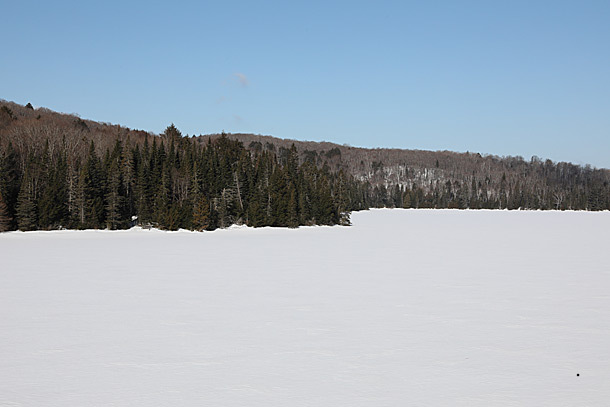 Image: Brewer Lake in Algonquin Park on April 4, 2019 (click to enlarge). 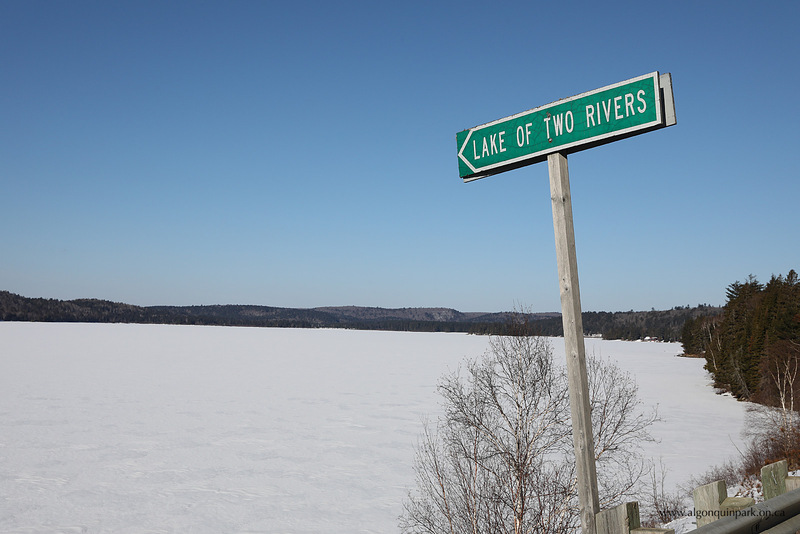 Image: Lake of Two Rivers in Algonquin Park on April 4, 2019 (click to enlarge). 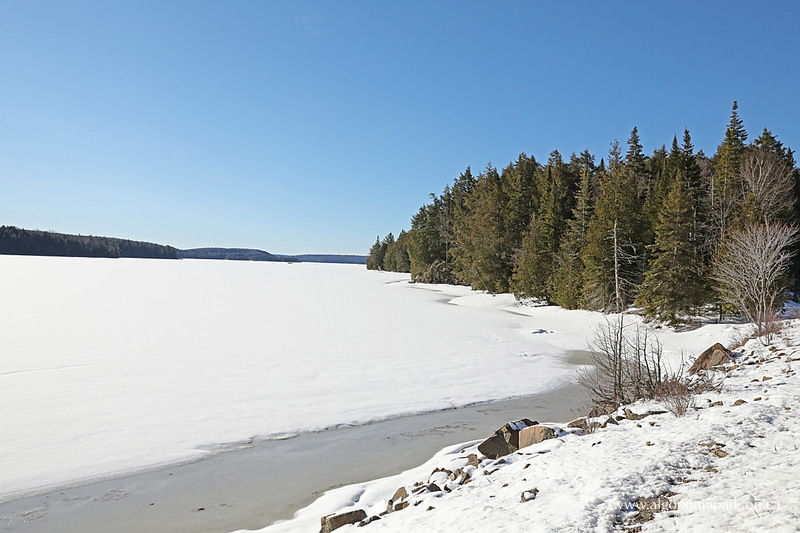 Image: Mew Lake in Algonquin Park on April 4, 2019 (click to enlarge). 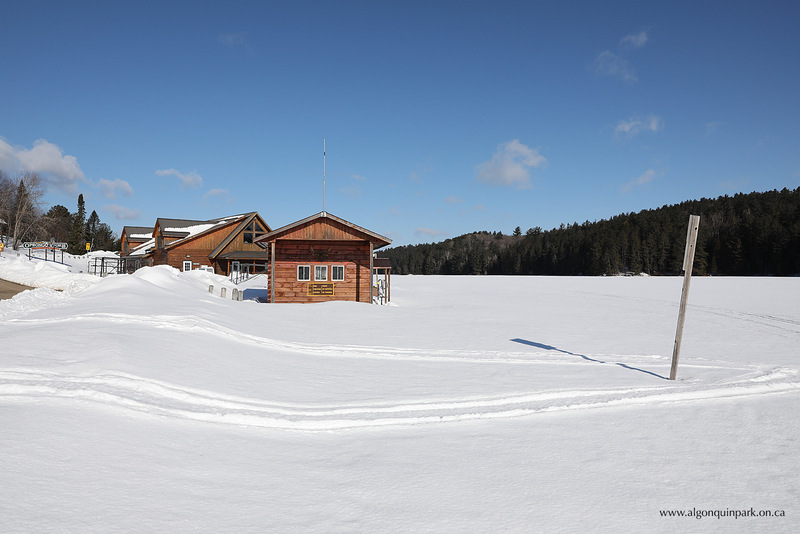 Image: Canoe Lake Access Point parking lots in Algonquin Park on April 4, 2019 (click to enlarge). Image: Canoe Lake in Algonquin Park on April 4, 2019 (click to enlarge). 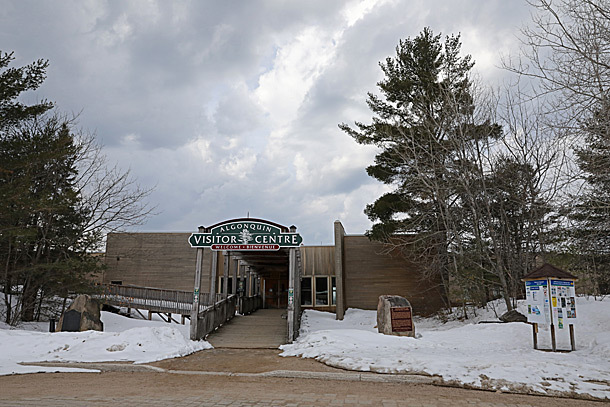 Image: West Gate in Algonquin Park on April 4, 2019 (click to enlarge). 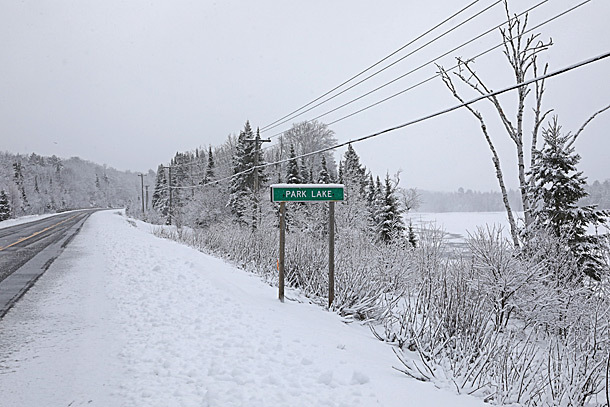 Image: Park Lake in Algonquin Park on April 4, 2019 (click to enlarge). 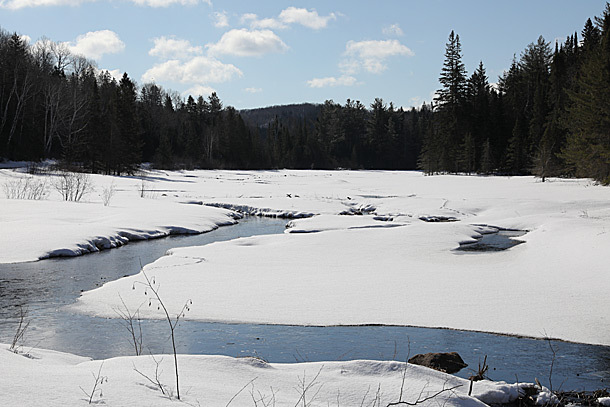 Image: Smoke Creek in Algonquin Park on April 4, 2019 (click to enlarge). 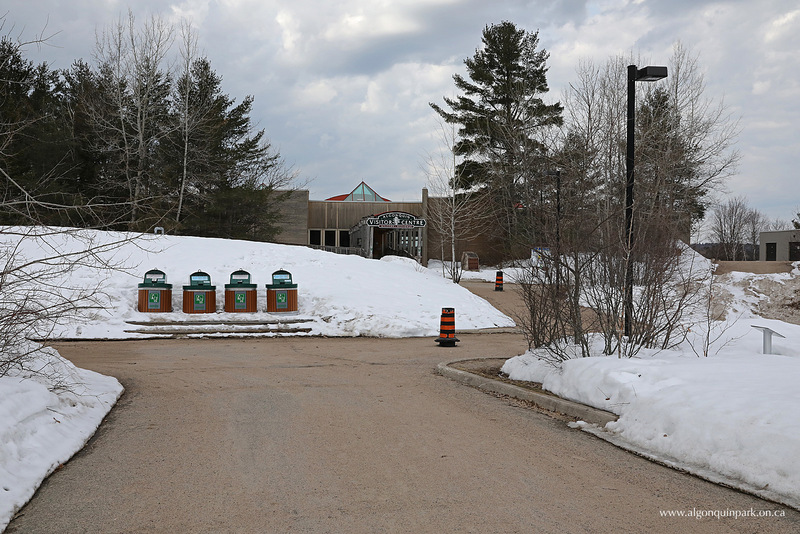 Image: Algonquin Park Visitor Centre parking lot in Algonquin Park on April 4, 2019 (click to enlarge). See more images on The Friends of Algonquin Park Facebook Page. Technically, the official ice out date for Algonquin Park is recorded when at boat can safely navigate from the Lake Opeongo Access Point to the Happy Isle Portage in the North Arm of Lake Opeongo. Ice out for Algonquin Park's largest lake, Lake Opeongo, has ranged from as early as March 29 (2012) to as late as May 15 (1972). 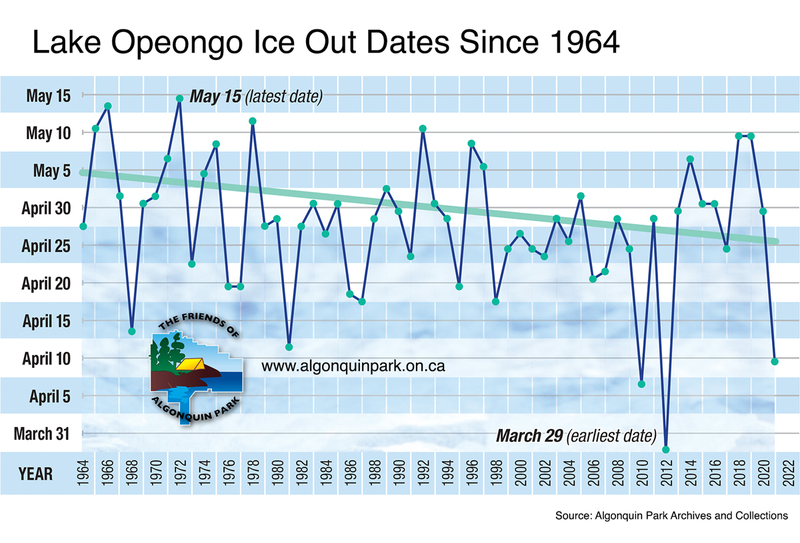 The current average ice out date is April 28 (1964 to 2016), shown by the dotted trend line below. 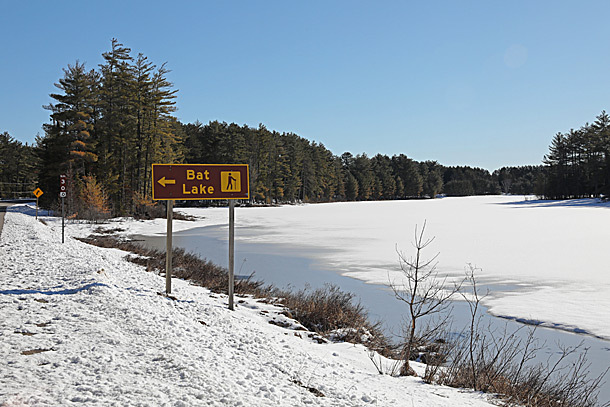 The official ice out date for Lake Opeongo in 2015 and again in 2016 was May 1. 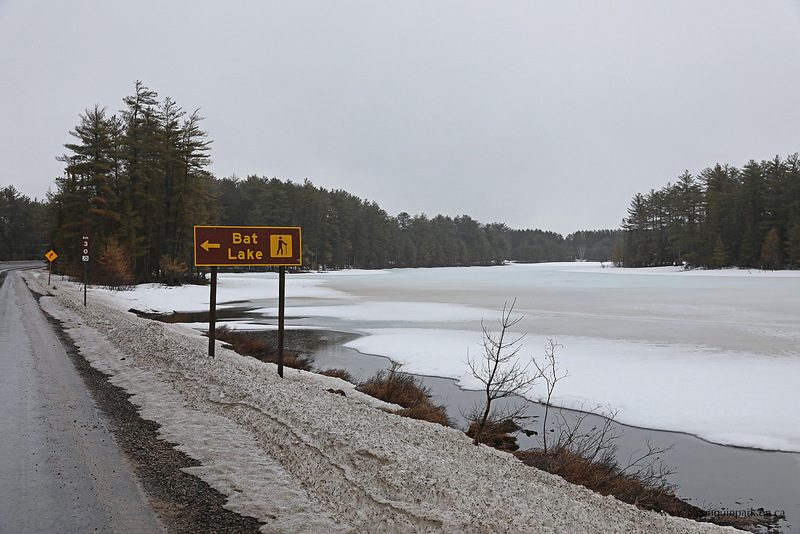 The ice out date for Lake Opeongo in 2018 was May 10. 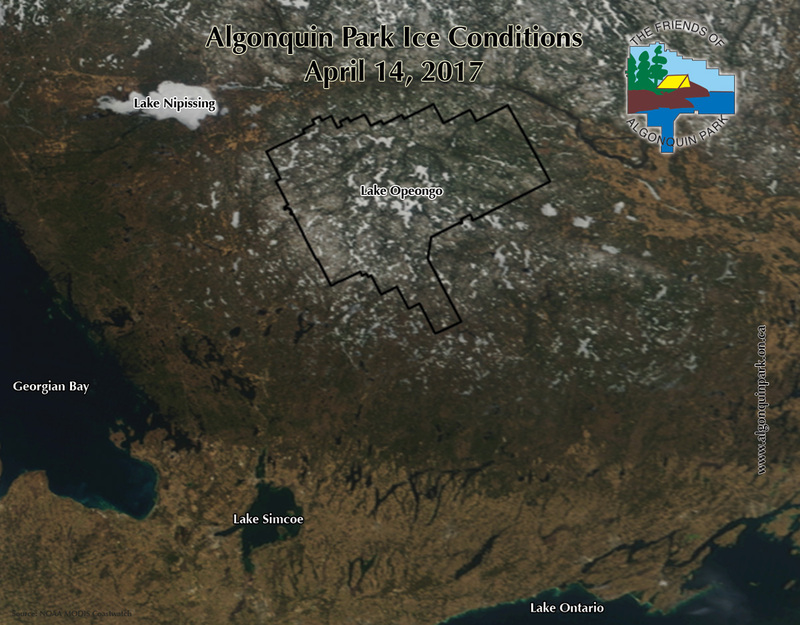 Below is satellite imagery of the Algonquin Park area. Imagery is taken on a regular basis with the best images recorded on completely clear days, which can be infrequent during late winter/spring. 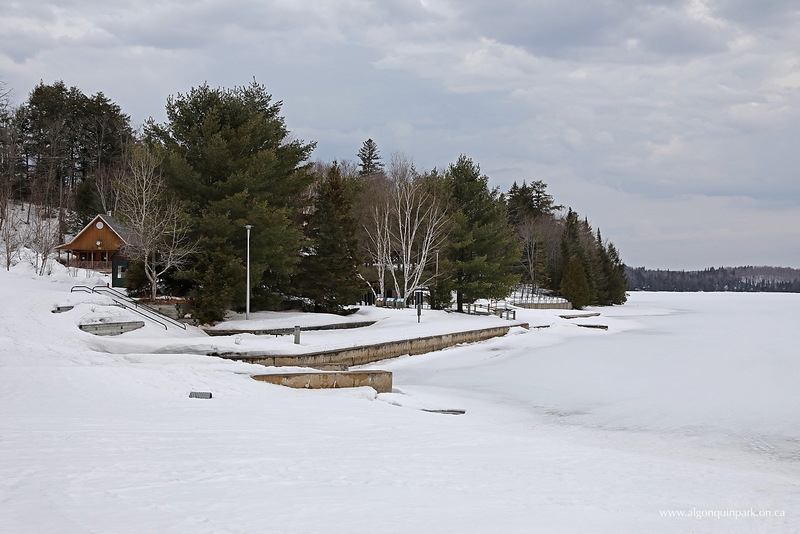 Images are posted to highlight the overall changes in ice conditions in south-central Ontario. 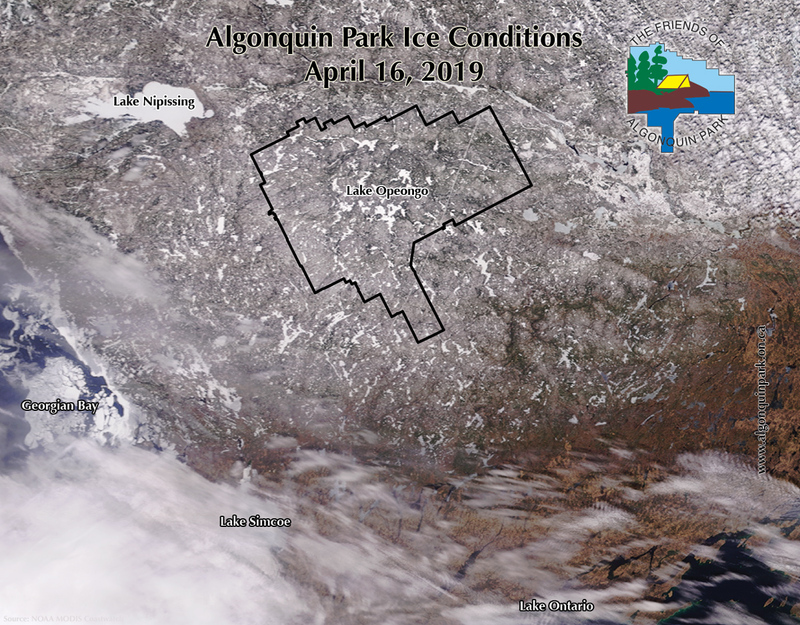 Image above: Satellite image from April 16, 2019 showing lakes in Algonquin Park (and central Ontario) completely ice covered. 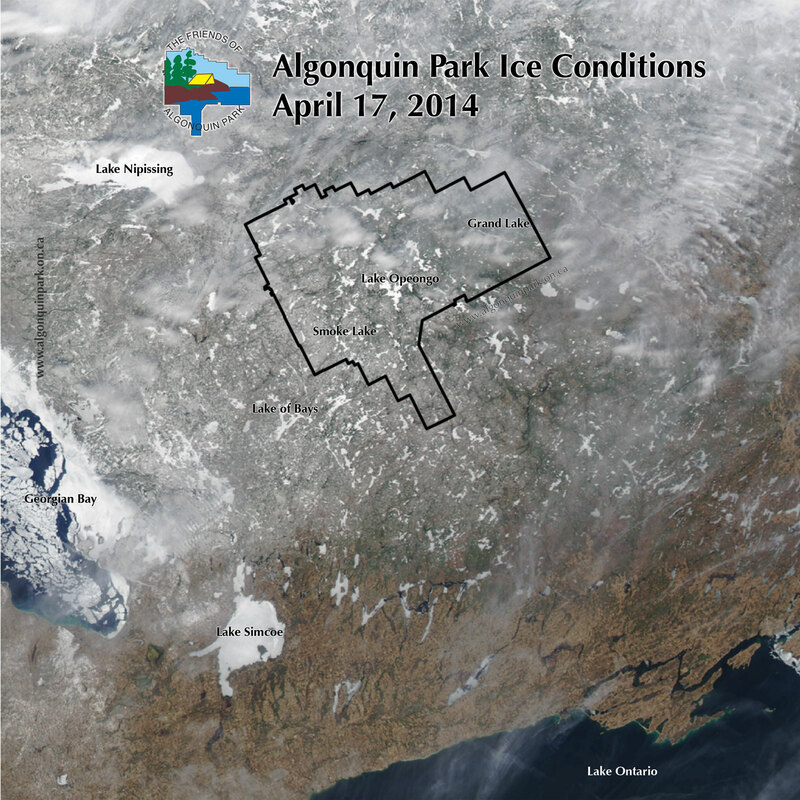 Bare ground and deteriorating ice quality is observed in southern Ontario (click to enlarge). 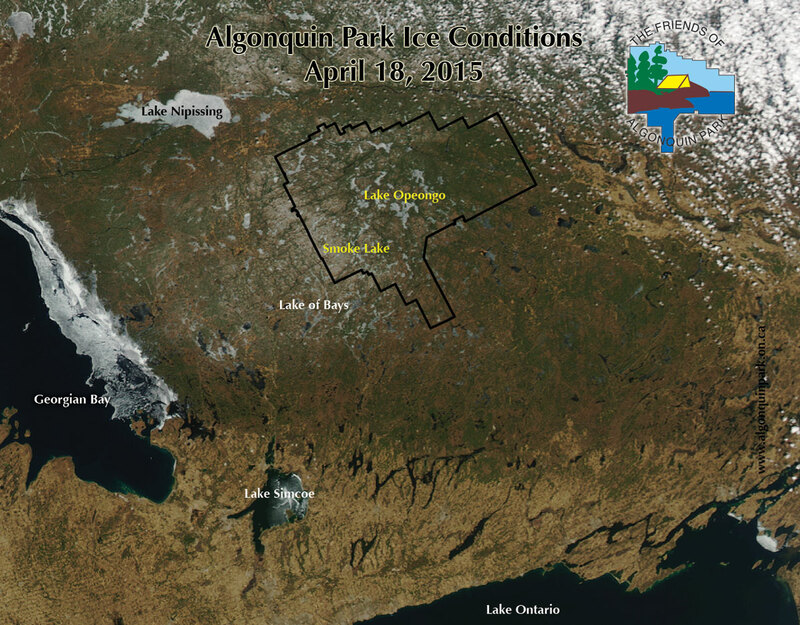 Below are satellite images of the Algonquin Park area from recent years for comparison purposes. 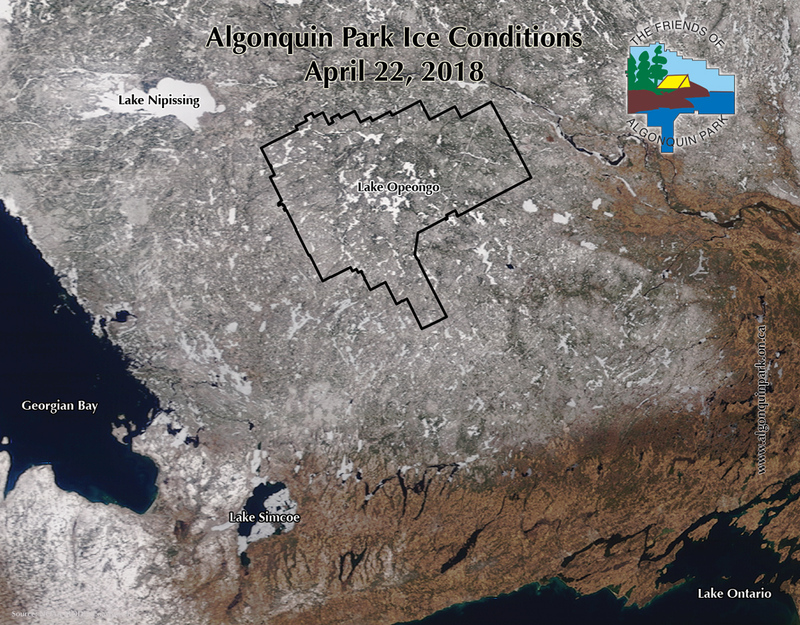 Official ice out dates for Lake Opeongo (Algonquin Park's largest lake and traditionally one of the last to shed its ice cover) are listed with each image. 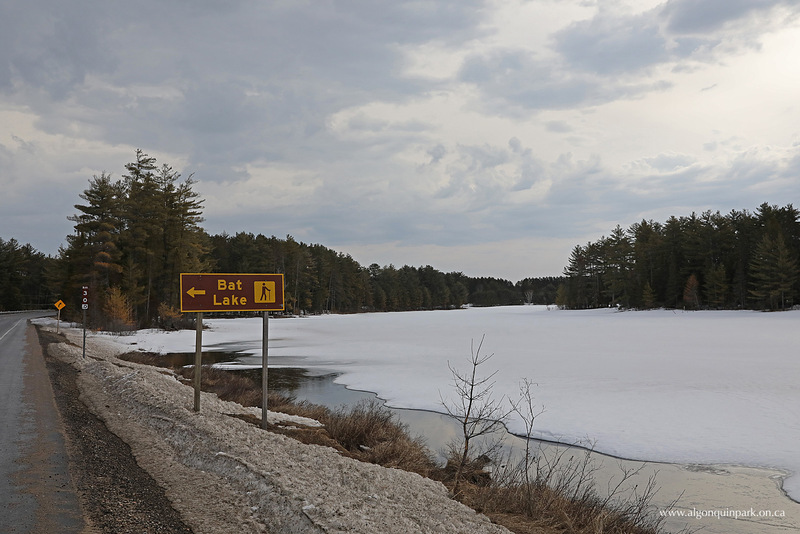 The spring of 2012 was record early by about a month and ice on Lake Opeongo melted by March 29. 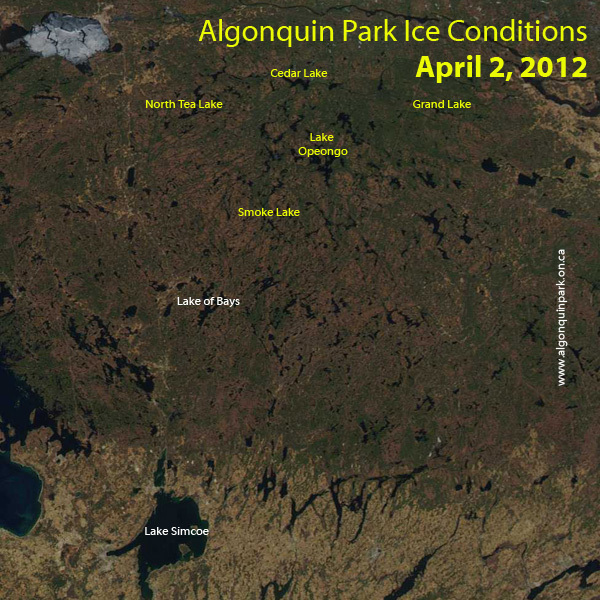 All lakes in Algonquin Park were ice free by April 2, 2012.